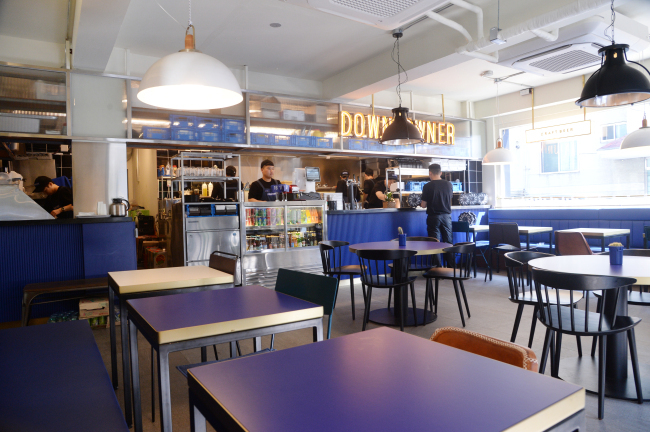 When Downtowner, a burger spot, first opened in Hannam-dong last year, it was a quiet and uneventful affair. “On our first day, sales were 100,000 won,” said CEO Joon Lee, 36. Lee revealed it took two months for word to spread. Now, people stand in line to get their hands on one of Downtowner’s famous burgers. When a second location opened several weeks ago in Sinsa-dong, there was already a line of people waiting to grab lunch on the first day of business. Word had spread fast. 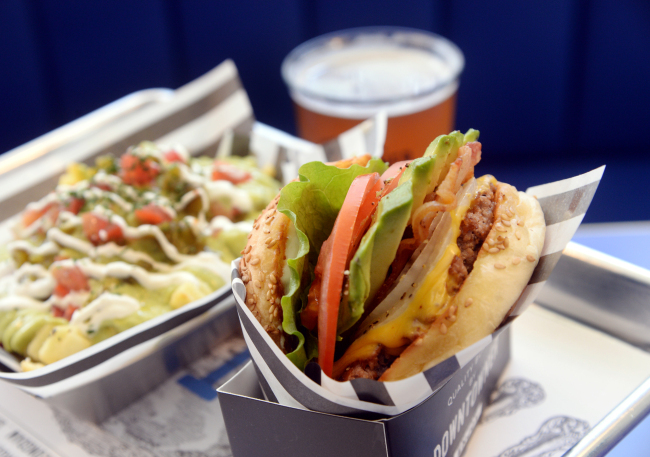 Lee attributes the steady and growing success of Downtowner to friendly service, tasty burgers and snap-worthy packaging. Amongst the line-up of burgers on the menu, the avocado burger stands out. Slices of avocado are seasoned with olive oil, salt and pepper before being carefully fanned out over a 130 gram beef patty with cheese and crisp bacon. The bun, crusted with sesame seeds, is soft and works well with the creaminess of the avocado. According to Lee, this is their most popular burger. Then, of course, there is the presentation of the burger. The burger is served in a paper carton standing up, so one can see everything that went into it right away. 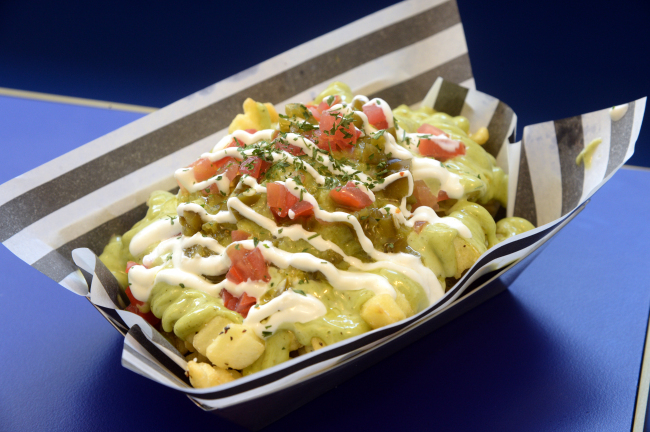 Fries are crinkle cut and served up six different ways, including their most popular garlic butter dressing -- a sweet and rich take on topped fries -- and a guacamole variation amped up by slices of jalapeno. There are meaty chicken tenders slathered in everything from a General Tso’s chicken-inspired sauce to a basil cream variation. Then there is beer, both draft and bottled, from Magpie Brewing Company’s flavorful pale ale to Brooklyn Brewery’s potent, intense and caramel-flavored Sorachi Ace ale. The selection of draft beer at Downtowner’s Sinsa-dong outlet is different from the selection offered at the Hannam-dong store and that, according to Lee, is intentional. Lee said he wants to keep these sorts of details, including the interior, different for customers who want to experience something new when visiting both spots. Lee is also busy adding a new burger to the menu, which will be available at the Cheongdam store soon. “We will soon be launching a protein burger,” Lee said, explaining that this will be an avocado burger wrapped in romaine lettuce instead of the usual bun as a low carb option. Plans are to eventually open a total of five stores in South Korea and Lee is already scoping out a location for his third store.